Ben & Holly Magical Playground Playsets are cute little playground rides, each set upon a leaf, that connect up together to form one large playground. You can get a slide, swings or roundabout. We were sent two of the playground sets to try out. Each set comes with the playground ride and a Holly figure. The two sets easily clicked together with a connecting bit on each leaf. The playsets are made of a strong durable plastic and the smaller parts on top are made from a more rubberised flexible plastic to ensure they won’t break. 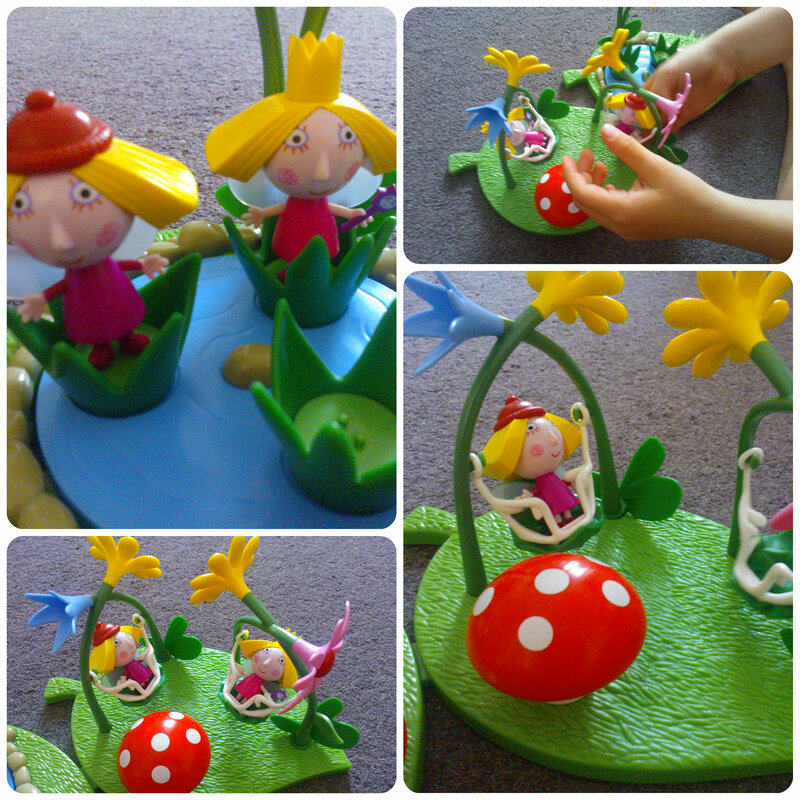 Each set has a play ride and a toadstool to add detail. The roundabout consists of three leafy seats with two little prongs which fit into small holes in the bottom of the figures feet, although this was a little fiddly to do. You can then spin the roundabout around so the figures can enjoy the ride. There are two swings and the figures just slot in the seats and if you push them down enough their feet go under a bar that holds them securely and then you can swing them backwards and forwards. My two both loved playing with these and have always had a soft spot for Ben & Holly as we have books and dvd’s of the series. Mister B loves little characters and as well as taking the Holly figures to the park they also went for a ride on his tractors! Miss M enjoyed them although she is at the older end of the spectrum. I’d say these are best suited for 3-6 year olds and would make a great addition to any other figure playsets they may have. It’s great that you can buy the park pieces and mix and match with as few or as many as you want. I think any little Ben &Holly fan would love these! 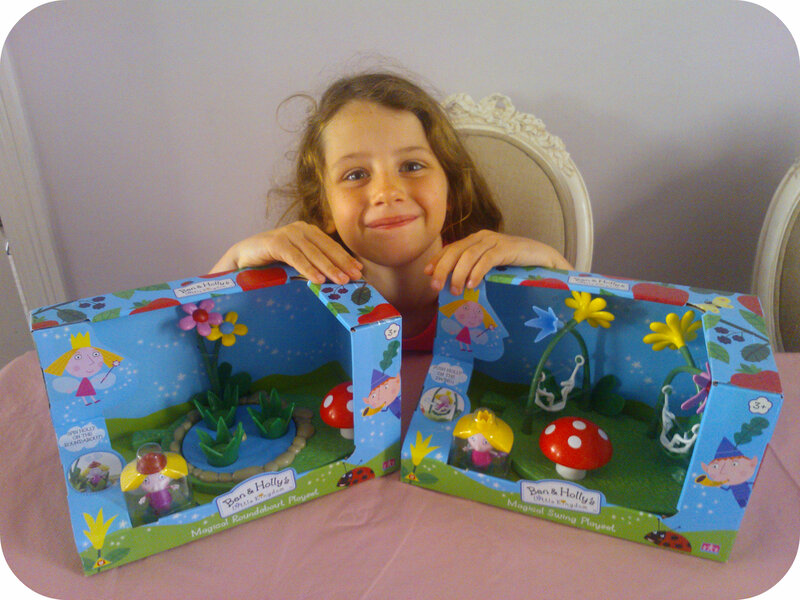 All reviews are my own and my family’s opinions and we received the playsets in order to write the review. This entry was posted in Reviews and tagged ben and holly, figures, holly, playground, playset, roundabout, swings by Fiona Martin. Bookmark the permalink. They look cute, Monkey has always been taken with this series and he loves Gaston for some reason. I am getting this for my daughter for christmas! They look good! These are really cute but I can never understand why they don’t mix up the included characters. It’s the same with so many of the sets like this. These look so sweet! My daughter has some of the Peppa Pig sets and I know she would love these too as she is a massive Ben and Holly fan!